Charles, pictured above with his own chickens, has a special interest in poultry, having kept Light Sussex and sometimes other breeds for 37 years. He has provided assistance to many pet poultry owners as well as small outdoor flocks and commercial units. 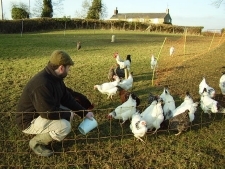 He has a flock of Utility Light Sussex selected for egg production and is available to discuss poultry issues and to advise on all aspects of poultry husbandry. Hatching Eggs are also for sale. (Light Sussex only). Please ask at Reception. We are an associated practice with www.chickenvet.co.uk , St David’s Poultry Team, Lympstone in Devon. For more details, see the link on our LINKS page, below. An outbreak of Avian Flu has been confirmed on a duck breeding farm in Yorkshire. The risk to public health is very low and there is no risk to the food chain.